If your heart is cut because you keep on hearing about how elephants continue to be hunted down in the wild for their tusks, without the poachers giving two hoots on how the earth’s largest land-based mammal is seriously dwindling in its population, then you might want to keep a reminder in your home to say a prayer for these majestic creatures each time you look at it. Why not take the practical route with the £12.99 Jumbo Cutlery Drainer? 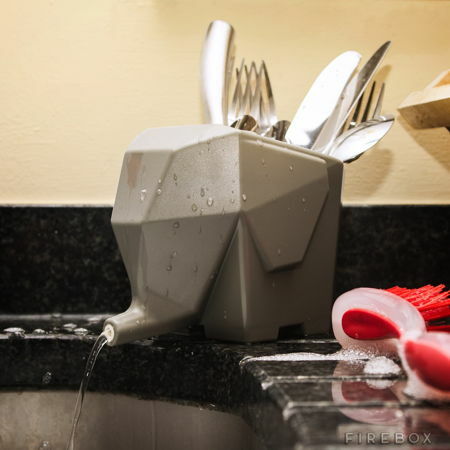 The Jumbo Cutlery Drainer would ensure that no clean cutlery will be left submerged in murky waters in the future, where your shiny silverware remains cleanly stored in the belly of the beast. All excess liquid will flow down his trunk, and right back into the sink.